washimizu Hachiman-gu Shrine (jap. 石清水八幡宮) is one of the three most important Hachiman-gu Shintō shrines in Japan. It was founded in 859 by the monk Gyokyo on the instructions of the Emperor Seiwa in Yawata. Iwashimizu Hachiman-gu enshrines Hachiman, the God of War, associated with the mythical Emperor Ojin. Iwashimizu Hachiman-gu was built for the protection of the Emperor in Kyoto and grew to be one of the most powerful shrines in the country. Shrine's main festival is held on September 15th. During elaborate rituals fish are released into the shrine pond and the nearby Hojo River and young children perform a "butterfly dance" on the Angobashi Bridge. So it is a place that's been a religious center for almost 12 centuries, that was founded before Polish state was even created (which happened only hundred years later). Exactly 110 years later (in 966) our country became a Christian state. Iwashimizu Hachiman-gu is interesting for us not only because what I already described, but because of connections with Thomas Alva Edison (1847 - 1931), one of the most important, most brilliant scientist and inventors of modern times. 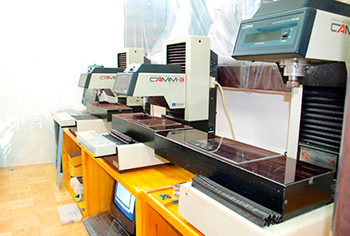 Have you noticed that Miyajima Laboratory brand belongs to a company called Otono-Edison Labs? The company was founded by Mr Noriyuki Miyajima, and the name was sort of a tribute to the inventor he admired most. As it turns out, connections between Edison and Japan were much closer than the ones implicated by a simple admiration for his achievements. As you might know, the founder of Edison Lab. used a carbonized bamboo filament for his first, long working bulb (in 1880). Together with his assistants he experimented with 1200 types of a bamboo to finally select the one called Madake. Using this material allowed his bulb to work for over 1000 hours. This particular kind of bamboo was brought to US by Edison's assistant, Mr William H. Moore, who brought it from Japan, from Iwashimizu to be exact. The inventor of the electrical bulb visited this place himself in 1922. Yet another interesting fact – two of Edison's assistants in his Californian laboratory were Japanese, who later became known as founders of two gigantic corporations - NEC (Mr Iwadare Kunihiko, 1886) and Toshiba (Mr Ichisuke Fujioka, 1884). 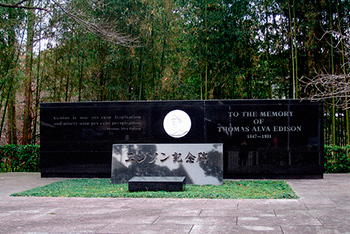 A stone memorial is dedicated to Edison in the grounds of the Iwashimizu Hachiman-gu Shrine. Visitors can also buy a lot of souvenirs Edison related there. Every year, on May the 4th, a „Festival of Light” is held and 1000s of bamboo lanterns are lit in Edison's honor. The “King of inventions” seems to be a particularly important figure for Mr Miyajima. Mr Edison seems to be “connected” to Japan, to Iwashimizu Shrine in particular. The Madake bamboo, that comes from this place, creates a stronger bond between these two worlds than one could expect even from such a strong, durable material. So using a small portion of this material for the latest Miyajima Labs' cartridge seems to be symbolic, as is its name - Madake. Portion of this material might be tiny, but it is used in the very heart of the place, where sound is born – it is a part of a cantilever. Stylus is glued to an aluminum element which is fixed together with a very thin piece of Madake bamboo. Despite the fact, that only a very tiny piece of bamboo is used for each unit, only a limited number of this cartridge will be manufactured, as this material can not be bought. Some small quantity was given to Mr Miyajima. This particular type of bamboo exhibits some very particular attributes like stiffness and durability. In grows in the mountains on a very particular soil rich with minerals and iron. 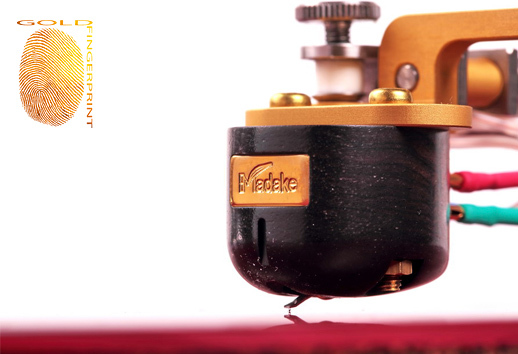 Mr Miyajima claims that its particular mechanical properties make it an ideal material for cartridge cantilever. A stone memorial dedicated to Edison in Iwashimizu Hachiman-gu. I think that what I regard as important about the development of the cartridge most is to pick up a feeble signal. It needs complete right working structure. 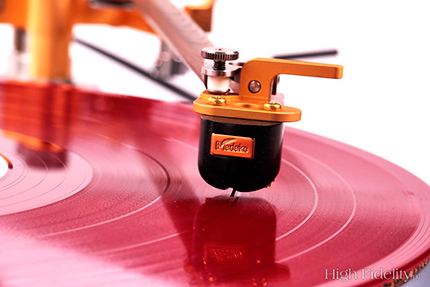 It is not important that a cartridge picks up a meaningless excessive signal. 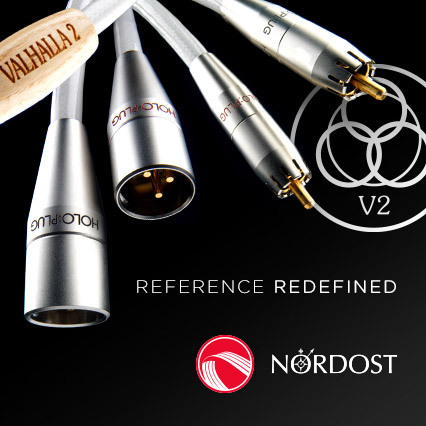 Currently most cartridge engineers do an effort not to cause the distortion with the excessive signal eagerly. However, an engineer does not notice that the effort extinguishes an impression of the music. 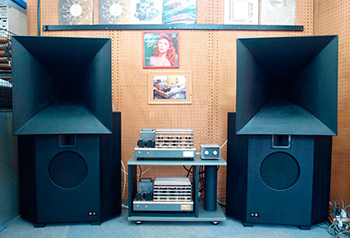 I think that the most of the audio product have not been yet completed. The most important development is structure development. Precision and materials have a meaning on complete structure. 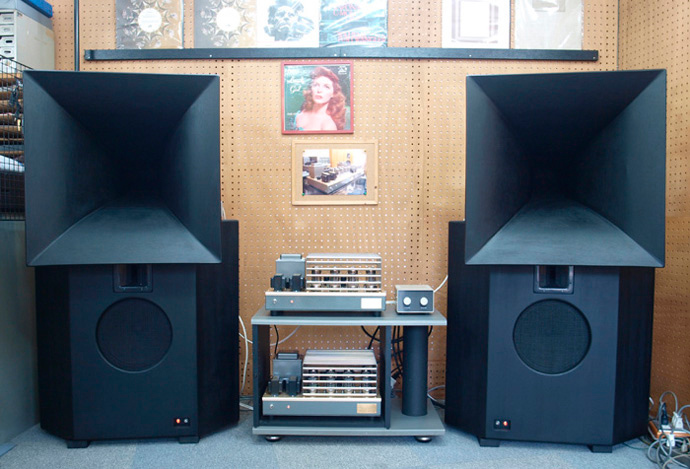 Noriyuki-san's system, used in his shop: a tube preamplifier EC 5 + OTL MODEL2010 power amp, both made by himself. He uses them with horn speakers. A musician playing the splendid musical instrument, the vocalist of the splendid voice use various kinds of sounds properly. And a feeble signal is the most important to the expression of feelings in particular. I think that I am greatly influenced by the reproduction power of the feeble signal how much value is got by one piece of LP. When I was impressed by the performance of my favorite LP again, I judge that my cartridge evolved. Modern machines used to wind coils for Miyajima-Lab's cartridges. REVIEW: Miyajima Laboratory WAZA + PREMIUM BE, see HERE.